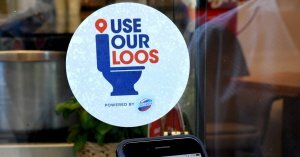 By visiting www.toiletmap.org.uk on a computer or smartphone, a map will reveal the nearest available toilets based on your location. Look out for businesses displaying the 'Use our Loos' logo in their windows. If you are a business-owner who wants to join the Use our Loos scheme and feature on the Great British Public Toilet Map, simply register at https://www.facebook.com/UseOurLoosUK/. In return, Domestos will provide you with a free welcome pack.